At around nine Sunday evening we board the overnight train heading for Lao Cai. We were to spend the night in a six-berth ‘hard’ sleeper. I was concerned for my comfort at first, but it turned out the cramped berth was not all that bad and after Alexander got one of our fellow travelers to turn of the music he was playing for all on his phone we had a fairly comfortable rest. We arrived at Lao Cai just after five the next morning, a pleasant chill in the air. After some initial waiting for our minibus to fill up we finally started the slow drive up the mountain pass to Sapa, a scenic ninety minute journey, passing terraced rice paddies and local villages on the way. 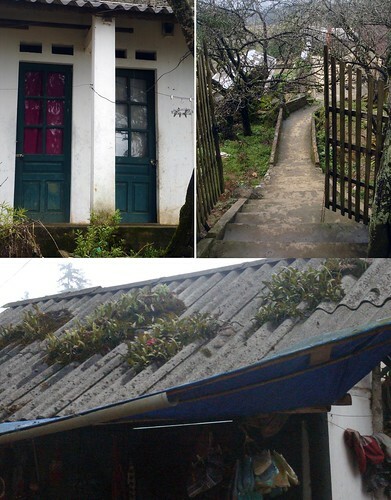 Sapa was a bit of an old hill station back in the day, where homesick colonialists came to soak up the cool mountain air. Today it draws throngs of tourists curious to see the ethnic minorities from the surrounds come and peddle their wares in town, or adventurous hikers. Or, in our case, people who miss icy cold weather. Sapa is spectacular. It is surrounded by high mountains and deep valleys, covered in villages, terraced farmlands and rice fields. Mist and clouds hung over much of the valley and area, which made seeing Vietnam’s highest mountain, Fan Xi Pan, impossible. But the views from town were still mighty impressive. After checking into a hotel and a very hot shower we bundled up and strolled around town. Everywhere we went we were hassled by good-humored Hmong and Red Dzau ladies to buy hand stitched blankets or bags and silver. They are very persistent and would follow us around for long distances, tugging at our arms and saying “Looky-looky. You buy something for me?” I’m usually easily bothered by touts and people bothering me with their goods, but these ladies never failed to make me giggle with their persistence and simple and confusing English questions. We went for lunch at Baguettes et Chocolate, a restaurant training less-fortunate youths for the hospitality industry. 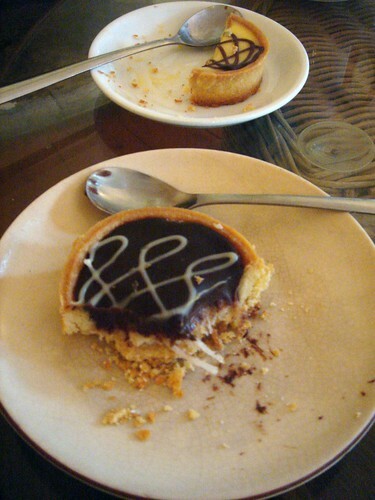 For dessert we enjoyed little chocolate and wine tarts; which reminded us both of the recent HHDD challenge I hosted. Afterwards we went back to the hotel for an afternoon nap. I awoke much later to find that thick blankets of fog were rolling into town. Within minutes the whole town was covered and it became almost impossible to see to the other side of the street! I made my way to a bakery across the street and picked up some hot chocolate and a chocolate roll to enjoy in bed. Much later we again ventured out into the foggy streets to a restaurant where a warm fireplace invited us in for dinner. 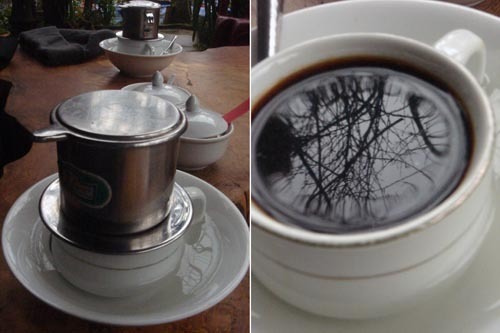 After a breakfast of warm beef pho we enjoyed coffee at a very informal little shop in an overgrown orchid garden. The menu consisted of pretty much only coffee, ranging from numbers one to nine. I asked the proprietress what nine was and she answered that it was very good Vietnam coffee. We ordered. We were not disappointed. The coffee was thick and rich with a cocoa aftertaste, which was slightly enhanced by adding a little bit of fresh milk. We slowly sipped, while enjoying the garden. Later we wandered through the local fresh produce market, admiring all the wonderful things on sale an trying some local snacks. 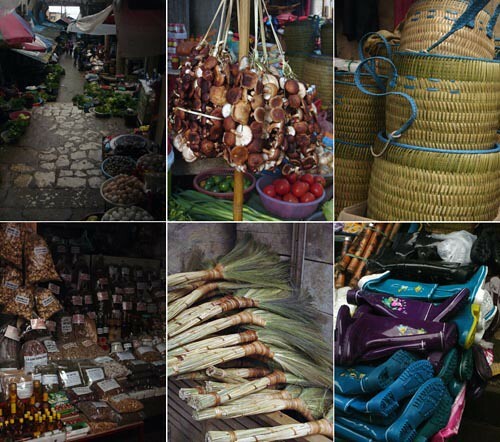 Upstairs from the wet market is a dry market where some Hmong and Dzau ladies sell blankets, bags, skirts and silver. I bought some fabric and Alexander a Hmong blanket. Much later, after perusing through his shopping bag, a Red Dzau lady insists that he buys from her as well. “You buy Hmong, now you buy for Red Dzau. Looky, Red Dzau all hand make, I make, by hand. Hmong, looky, machine!” Even though I can see almost equal parts hand and machine work in both I decide to make her happy and a buy an embroidered bag. At six in the afternoon, the whole town again disappearing behind drapes of fog, we get back on a minibus, heading for Lao Cai this time. This time we got berths in a four-sleeper, with a much more comfortable mattress and it is not long after the train pulled away that the steady rocking and comfortable bed make me drift off. It’s just after five the next morning when we arrive back in dark and atmospheric Hanoi. This time the city is just waking up, and from the station we head straight to a pho corner for steamy bowls of chicken pho for breakfast.